Steven M. Tipton, CSLR Fellow and C.H. 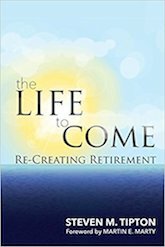 Candler Professor Emeritus of Sociology of Religion, has authored, A Life to Come: Re-Creating Retirement (Wesley's Foundery Books, 2018). His work discusses mastering "the arts of living in retirement." Tipton writes: "Now is the time to think twice about retirement. Not only about its public policy and planning in the face of contested crisis, but about its emerging ethos, with a feel for its saving promise of true self-renewal and graceful fulfillment in the life to come in this world, however shining or unsure salvation seems in the next."